Kaos is back! Help save Skylands! Owners of Skylanders: Spyro's Adventure will want this! Totally awesome Portal Owner's Packs for Skylanders: Giants. Collect all of the Skylanders mini-figures! Kaos is back! The Skylanders: Giants Portal Owner's Pack for the Nintendo 3DS comes complete with video game, Skylanders figure, character collector poster, sticker sheet with secret codes, and Skylanders Trading Card. Get in the game and help save Skylands! Ages 10 and up. Note: Only purchase this pack if you already own Skylanders: Spyro's Adventure. Power Portal not included. 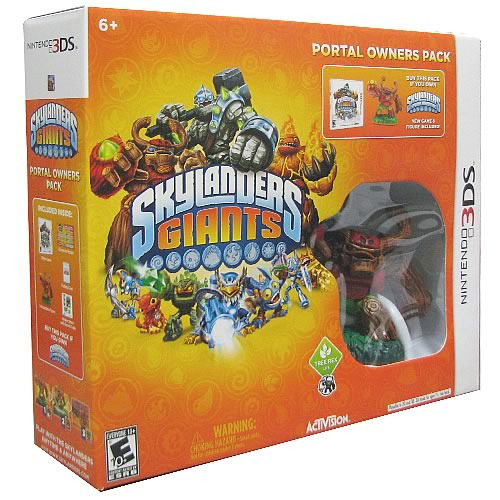 You can use the portal included with other Skylanders games or order a Skylanders Starter Pack (sold separately). Thousands of years ago, the Skylanders Giants fought epic battles in Skylands, but were banished to Earth. With a new threat looming, it's time to bring them back to join forces with the Skylanders. Only you can put them on the Portal of Power to unleash their strength in the ultimate battle to save Skylands!